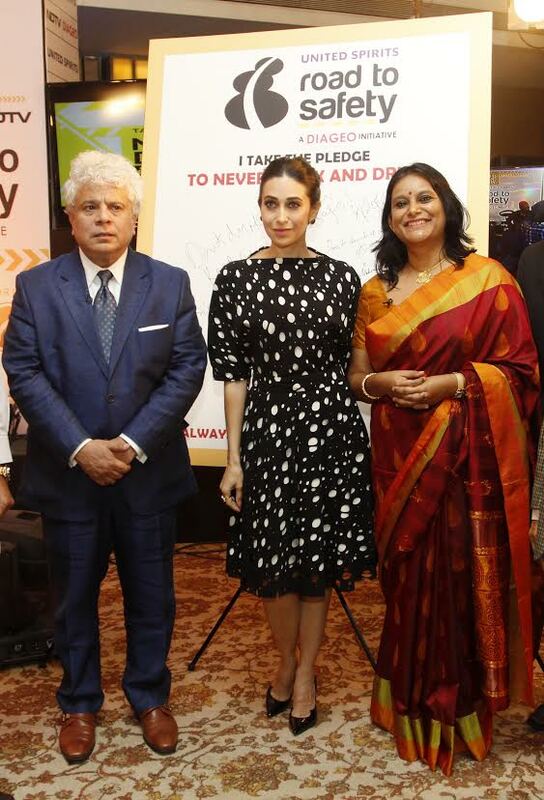 Mumbai, 22 November, 2016: United Spirits Limited (USL), a Diageo Group Company, today announced the launch of Season 3 of its Road to Safety initiative with Bollywood actor - Karisma Kapoor pledging her support for the cause of road safety in India. As part of the launch was a special panel discussion on ‘Road Safety: New Challenges and the Road Ahead’ attended by Suhel Seth – CEO, Counselage India, Shaina NC – Spokesperson BJP, Abanti Sankaranarayanan - Chief Strategy and Corporate Affairs Officer, USL, Seji Cherian - CEO, Save Life Foundation, Dr. Shankar Vishwanath - Hon’ble advisor, Mumbai Traffic Police, and Dr. Sanjay Oak – Ex Dean, KEM Hospital, sharing their insights and solutions for issues affecting road safety in India. This campaign also includes working with law enforcement agencies and government bodies to provide capacity-building training to India’s traffic police officials and educating commercial drivers and university students on the perils of drunk driving. In Season 3, citizens will be encouraged to celebrate responsibly by nominating a ‘Designated Driver’ during social occasions and celebrations, inspiring them to play a crucial role in road safety in India. • Trained 4000 police officials on traffic regulations, enforcement of drunken driving offences; types and correct usage of breath alcohol analysers. • Received over 3,00,000 pledges to “Never Drink & Drive’ from people from all walks of life through the social media and on-ground activations.